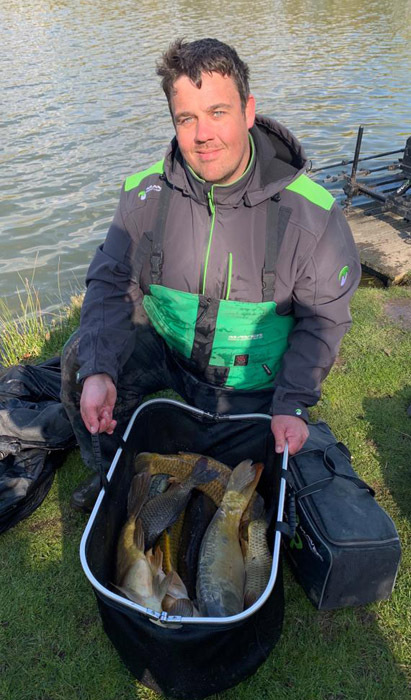 Match This 2019 qualifier number three (3) made it’s way to Maver Hayfield Lakes in South Yorkshire for the first of a series of qualifier events to be held at the venue this year. The sell out match saw one hundred and twenty (120) anglers braving what was arguably the coldest day of the week with an easterly wind making temperatures feel decidedly chilly. A hard overnight frost, clear sky’s and bright sunshine didn’t bode well for big weights with many expecting a very hard match and a possible winning weight in the region of 70lbs coupled with low back up weights. Hayfield is well known for its ability to produce match winning weights from a large number of pegs and, with conditions on the day being less than favourable, it made for an extremely unpredictable qualifier. Winner on the day was venue regular and current Mega Match This Champion, Dave Burley (Maver UK). Dave drew Island peg 34 and, with the wind full in his face all day, opted to fish the pellet waggler at 20-25 yards out, which was as far as the wind would allow him to feed and to cast consistently. Feeding 8mm fishery pellets and fishing 8mm banded hook bait he stuck to this method throughout the match to produce a stellar performance to land carp to 12lbs and finish the match with a winning weight of 80lbs 12ozs to become the third man through to the 2019 final. Dave also qualifies for this year’s Maver British Pole Championship final in August. Dave is only the third angler in the competition’s history to have previously won the title and qualify again the following year for a chance to defend the sport’s most iconic piece of silverware. Second place on the day went to former England feeder team manager and Maver backed Tom Pickering. Tom is another angler who fishes the venue on a regular basis, and has been enjoying great form of late. Tom drew peg 38 on Adams Lake and decided to fish the method feeder at 40 yards using micro’s and 8mm pellet to land carp to 12lb and finish the match with a total weight of 61lbs. Tom also qualifies for the British Pole Championship final later in the year. Third place went to Richard Toomer (Angling Direct), who drew Island peg 51. Fishing the method feeder cast to the Island he also used micro’s and 8mm pellet to catch all his fish in the first two hours only to remain bite less for the remainder of the match. Richard found carp to 12lbs for a final weight of 55lbs 8ozs to take the last of the automatic British Pole Championship qualification places.